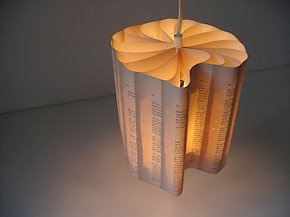 Elle Decoration SA: Guest blog: Book Art! Today Denise Kiggan of Durban-based blog, Freshly Found! is our guest. 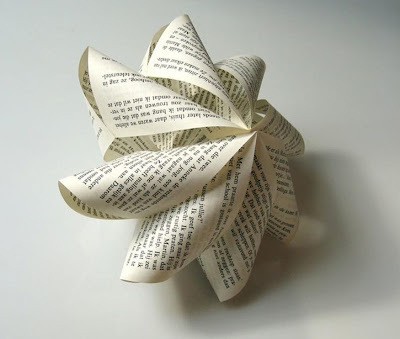 Paper really is a fascinating medium, and book art has been popping up all over the place lately. 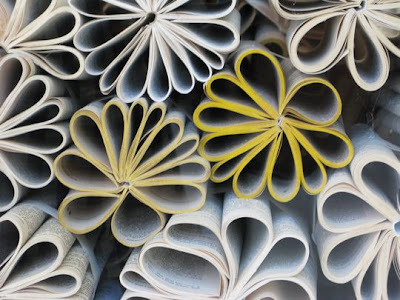 The 2008 Holland Paper Biennial coming up later this month at Museum Rijswijk, where 27 international paper artists will be showing their work, so I thought I'd share some paper art I've come across lately, in the form of repurposed vintage books. 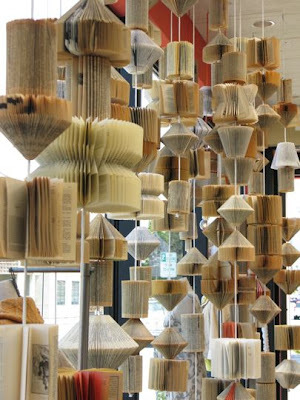 The beautiful folded books above and below, recently featured by Apartment Therapy, are from one of the inspirational window displays at Anthropologie. Food and Interior Stylist, Paul Lowe of Sweet Paul has been styling a series called "The Written Word". The paper sculpture vases and the picture holder in the pics below show some of Paul's creativity. These delicate decorations are some of Michael Bom's handiwork too! 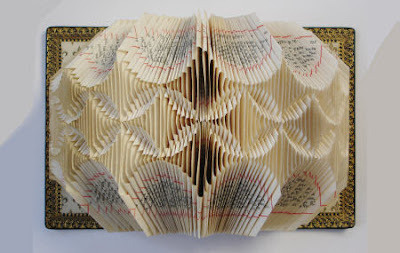 The folded church book below is made by French artist, Lucille Moroni , who participated in the Paper Biennial in 2006. She first saw a book with folded pages in a shop window in Lyons, and knew at once that this was something for her. Now she works with 19th century church books and missals, taking care to fold the pages to correspond with the contours of the gilded decorations on the pages. The Lehman Maupin Gallery features Italian artist Stefano Arienti. He lives in Milan, where he works with found images and printed materials. His 'Sliced Books' are surprising and fun! 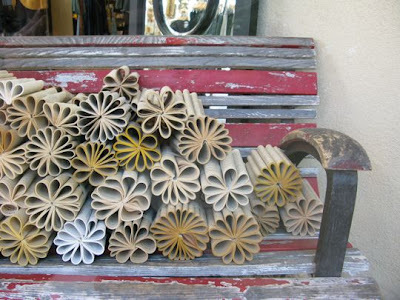 Jesse of Jezzeblog recently featured the work of South African artist Rickus Ferreira . 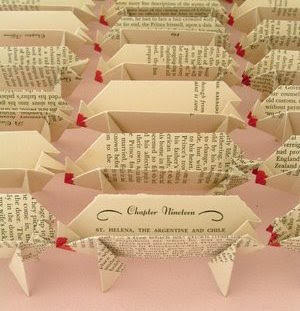 He took the pages out of the book before folding these delightful pigs! I was inspired enough by all this paper folding to try it out myself, and I made this side table from folded magazines. I've written up a tutorial on my blog, explaining how to make this side table with your own collection of magazines, so do pop over to see. And who knows, perhaps the dusty paperback novels on your bookshelf might just be ready for their Second Debut! What a lot of research you have done! Makes it so much easier for me to read rather than to hunt it down. 101 ideas for how to get books off the shelf! What incredible ideas, what clever people. My love of books has just got a new dimension. Lovely creation of Michael Bom!! This is fantastic collection of inspiration and ideas. I especially love the paper vases. Beautiful Denise, I think I like the Michael Bom work the best. I loved the delicate shapes he's made. Very inspiring. Lucille Moroni is incredible! Fantastic post with tons of great finds! Brilliant work! 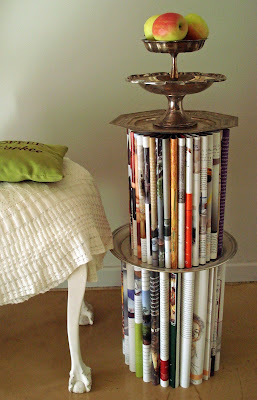 Ironically, I wrote a similar post about a lovely modern table made from old magazines and junk mail. The best part is that is was designed by teens. I love this "reduce, reuse, recycle" movement!